* Their survival horn can be heard over long distances, with a volume that reaches up to 120decibels. A popular camp-fire treat, popcorn, can be made easily and without a mess in the Coghlan’s corn-popper, a light-weight, compact, hand-held pan with a lid that can be held over the camp-fire to make popcorn. Their polypropylene dinnerware sets that can be squashed into a backpack are also big sellers. 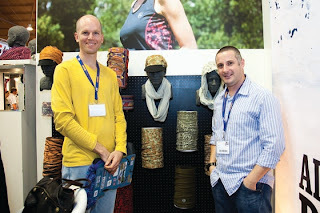 Every year Buff launches a range of new exciting colours and designs and 2012 is no exception, explained Leo Rust of SA distributor Adventure Inc. Buff introduced their new Infinity concept, a lengthy wraparound scarf that can be folded over twice to form a double layer scarf, at the OutDoor Friedrichshafen show. 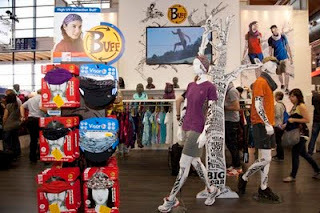 Although this range has the same technical qualities one would expect from Buff, it will be marketed to a more fashion conscious consumer. 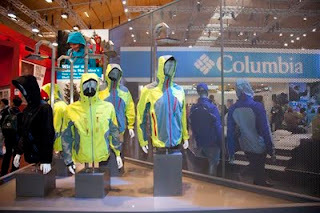 The new Storm hood is a wind-stopping Gore-Tex hood with a traditional Buff scarf incorporated in the neckline. This allows non-hooded fleece and shell jackets to be converted into hooded jackets. 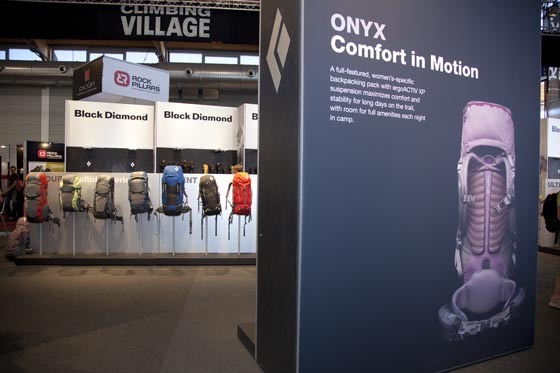 Black Diamond, locally distributed by Ram Mountaineering, introduced several innovative products at the OutDoor Show in Friedrichshafen. Their Gizmo, Cosmo and Moxie headlamps now feature two surface LEDs, explained Joel Lee, International Accounts Manager. Their proximity settings, designed to be used around camp etc, have an output of 24-35 lumens. The Spot headlamp, with an output of 75 – 90 lumens, is the no.1 selling headlamp in the US because of its new LED technology. The Icon headlamp, which is good enough to be used for safety and rescue purposes as it has an output of up to 200 lumens in a 100m range, will be launched in retail in January 2012. Black Diamond’s headlamps allow the wearer to access red LED’s, specifically designed for night vision, without toggling through white light, which destroys night vision. Once the red night vision mode has been selected the headlamp can be switched off and will return to the night vision setting once it is switched on again. Their range of trekking poles, the Trail Backers, have the 3-piece aluminium flick-lock system with a rubber grip. The Trail trekking poles feature moulded foam grips for the right and left hand. The Trail Shock pole has a shock absorbing function with a softer bottom section, stiffer top section and stiffest middle section. The women’s Trail and Trail Shock poles, which are new additions to the range, have a narrow grip and extra padding on the grip. The Black Diamond Magneton carabiners, said to change the way carabiners are designed in the future, lock and close by using the powers of magnetic attraction. 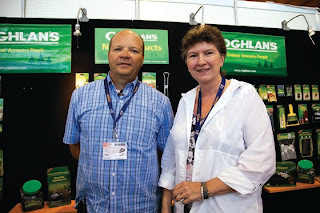 They were launched internationally in July 2011. 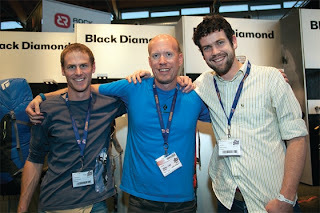 Black Diamond SA team Ryan van Niekerk (left) and Blake Tucker (right) with Joel Lee, international accounts manager. The Hike collection, which includes the Power Lite, Radiant, Matrix, Energy, FSN and Motion ranges, and the Access range, which is their entry-level ranges of escape, junior, cross walk and sport sandal footwear. 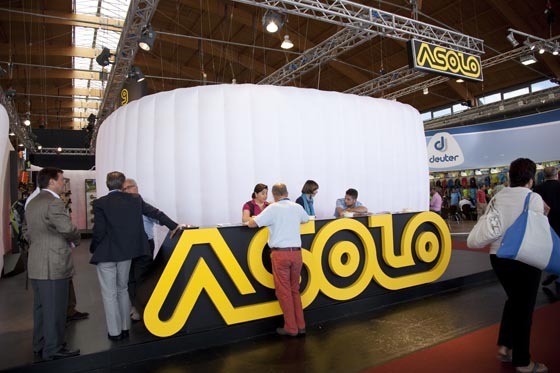 Marco Zanatta, the chairman for Asolo, says that the ranges that will fit more appropriately to the South African market will be the Backpacking, Hike and Access ranges as well as the lower climbing ranges in the Alpine category. Zanatta explains that the Asolo brand is very focused on fit – they have a triple fit system (either medium, wide or narrow fit) as well as a dedicated last for ladies (which is designed with a narrow fit). 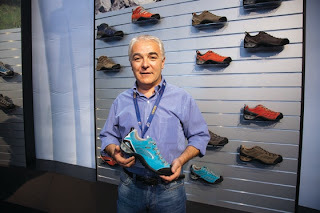 Asolo will be launching a brand new range of footwear for 2012, called the Motion range – a low cut, light hiking or approach shoe - which will fall under the Hike category. The outsole, developed in conjunction with Vibram, consists of an EVA midsole, a polyurethane heel and a cushion pad placed between the EVA and polyurethane. 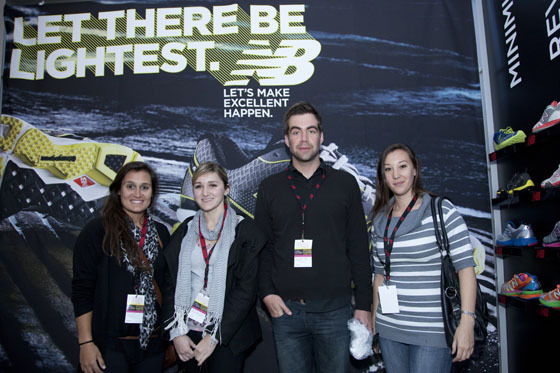 From left: John Andrews, Keaton Oddy, Katherine Tromp of New Balance and footwear analyst Julian Greenstein. Front: Justin Stevens. 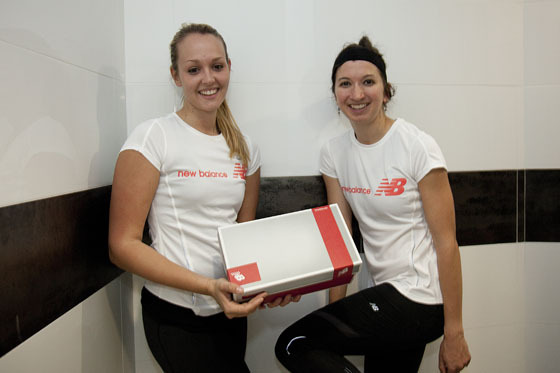 The latest New Balance Minimus Road and RevLite running shoe ranges were recently launched to the press, sport stores and footwear specialists at the Sports Science Institute of South Africa (SSISA) in Cape Town. Prof. Tim Noakes gave a fascinating overview of the barefoot movement and why scientists believe that humans have evolved into runners capable of running at different speeds during the midday heat. 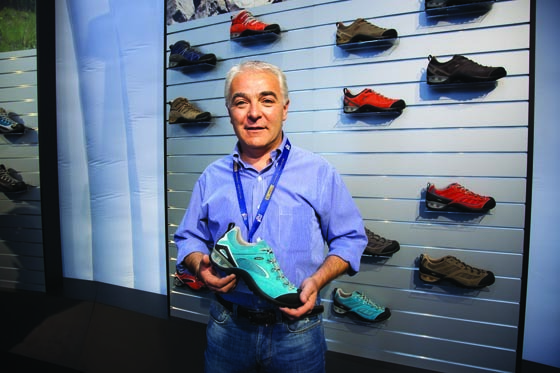 John Andrews, product manager of New Balance, introduced the Minimus and RevLite ranges to attendees and footwear tester Julian Greenstein gave his review. 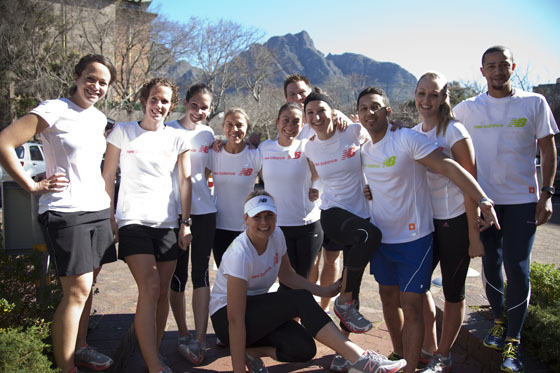 Though launched simultaneously in Cape Town, the RevLite and Minimus are by no means similar shoes. 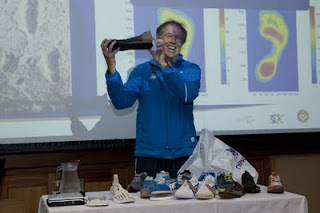 Prof. Tim Noakes showing the 'History of running shoes'. The neutral RevLite consists of a midsole foam compound with the durability of foams that are 30% heavier and is recommended for runners looking to move towards a more lightweight running shoe. The shoe allows for a bi-lateral flexing of the forefoot which allows the left metatarsals to move separately from the right. The Minimus Road shoe features a 4mm heel-toe (11mm heel - 7mm toe) drop and is recommended for runners who wish to train on the road in minimal shoes, as it facilitates a forefoot strike. The Minimus Road, family of the Minimus Trail and Minimus Life, is reminiscent of the shoes produced during the 70’s and 80’s before manufacturers started producing shoes with greater cushioning and support. Though not a 100% barefoot (zero drop) shoe, it’s an ideal ‘forefoot-strike’ transitional shoe. Whilst the Minimus Trail shoe would require less cushioning than the road shoe due to the terrain it will be worn in, it offers more stability than the Minimus Road. 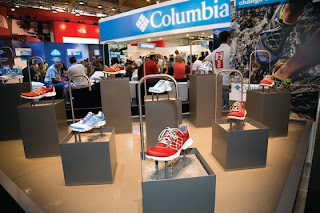 After the presentation, attendees were asked to run a few kilometres in the Minimus Road shoes. 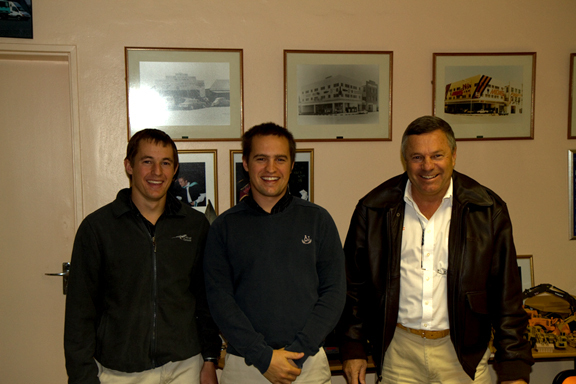 Quinten Fontyn of Model Sports (who will now be providing retail store-within-a-store concepts in De Jager’s Sports and other retailers), Sportsman’s Warehouse’s Sam Wright, Wouter Burger, Tarah Childes and Vikki Quarmby and Totalsports’ Megan Davis and Nicole Marais, as well as other press and footwear specialists, attended the launch. At the foot of the Hantam Mountains, surrounded by graphic kokerbome (quivertrees), lies the heart of sheep-farming in the Northern Cape, Calvinia. During our visit it vies with its neighbour, Sutherland, for the title of the coldest town. But the people are warm, from the hearty welcome, matched by innard-warming delicious boerekos at the Hantam House, to Leon Visagie and his daughter Melissa of MDL Sport. 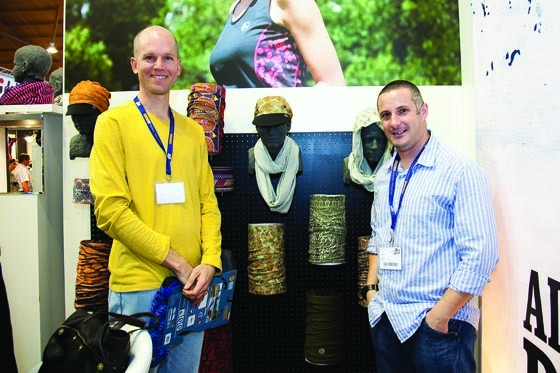 Opened just a year ago as an income provider for Melissa, Visagie initially didn’t expect the store to start making a profit for at least a year, “but within a month it paid her salary,” he says. 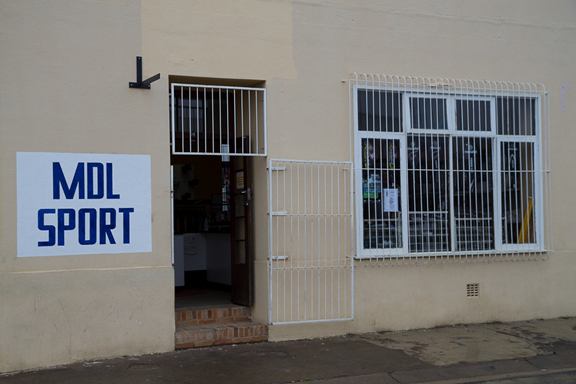 Which is perhaps not surprising in a town featuring a running club, golf club, cricket club and various schools - but no sport store. He is a big fan of rep Mike Wallace, who regularly visits, and his stock selection shows it. While footwear is a big seller, his safety concerns will not allow him to indulge in stocking products for his passion - target shooting. Burglar bars on the door and windows and a gate between the customers and Melissa are signs of the times. The old South African flag, prominently displayed, is a sign of times past. As Bill Gates of Microsoft said: “There is nothing like success to breed success.” And the Walker family in Upington is a good example of the truth of this. 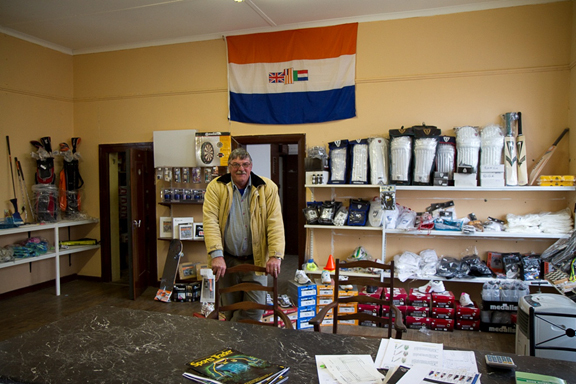 Ever since the father of the present owner of the 4 x 4 Mega and Walker Midas stores - plus several other businesses – took over the Upington Radiators and Motor Graveyard in 1959-60, they’ve become the first port of call for anyone looking for someone to take over an ailing business and grow it successfully. After two years of teaching business science, Eric Walker had joined his father, a former pilot, in the family business in 1981. 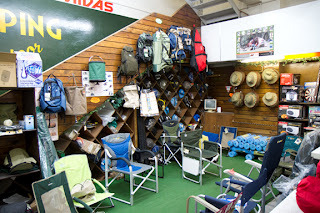 By 1986 the various enterprises also included a Midas store – then significantly smaller than the current building - which now houses a substantial, well-stocked, fishing section, as well as some camping gear. Several photographs of their first buildings and later extensions, proudly give a pictorial overview of the company history and growth. Along the ramp, leading up to the offices, hang rows of certificates for “Franchisee of the Year”, “Marketing Man of the Year” and other accolades. Camping sales have exploded over the past few years, says Walker, especially with gear used by 4x4 enthusiasts. 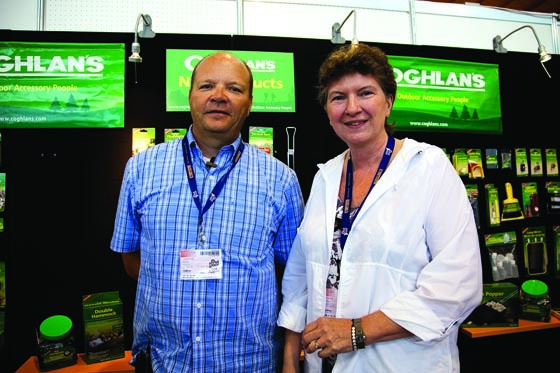 “Outdoor has become a big trend,” with customers travelling from as far as Springbok, Prieska and Kuruman to shop at their stores. 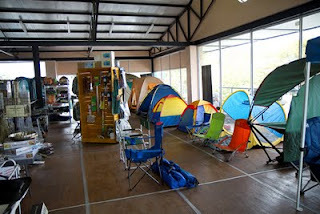 Four years ago they opened their second Midas store in town, and two years ago, after they opened the Mega World store, they moved most of the camping equipment to that shop on the outskirts of town. The floods didn’t have such a devastating impact on the town’s economy as some people believe, maintains Walker. The problem was that it was the earliest flooding of the Orange River yet and many farmers still had to harvest grape crops. “The export farmers were finished, but the grape producers for the local market suffered.” This year they delivered about 40 000 tonnes less than the 155 000 tonnes last year. Walker’s two sons, Max and Erin, are also involved in the business – the latter is currently developing systems to ensure the smooth running of the various businesses that also include a garage, an agency for IVECO trucks, a workshop, wastepaper and scrapmetal works, a test station, to name a few. He’s outgoing and exudes optimism. 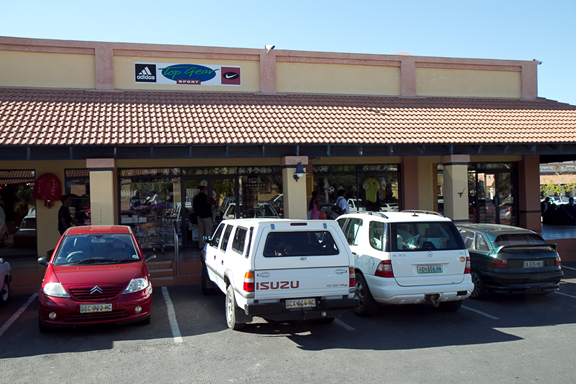 Rugby was the common denominator when Springbok Pieter (Slap Tjips) Rossouw, current Cheetahs coach Hawies Fourie (in Ceres), Tersius Gilliomee in George, and Van der Ryst in Upington founded the Top Gear stores at the end of the last century. And rugby is still a passion that he nurtures amongst the youngsters in Upington through coaching at the local schools and the establishment of the Top Gear team, consisting of players from various non-rugby-playing primary schools, coached by one of his staff members. 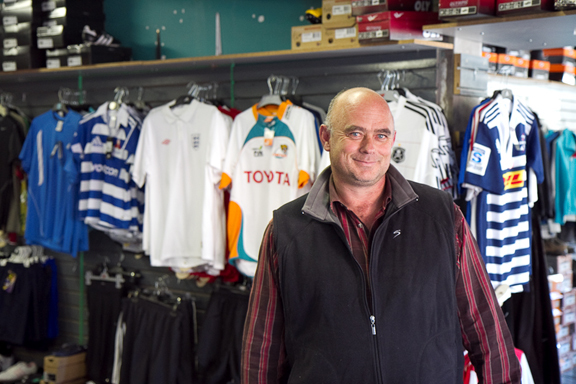 Although fully aware that the community actually supports soccer, Van der Ryst’s enthusiastic promotion of rugby seems to typify his optimistic approach to life. But, the floods earlier this year before the full grape harvest was in, did affect everybody in the community – with the farmers no longer coming to town to pick up labourers, the buying power just became so much smaller. 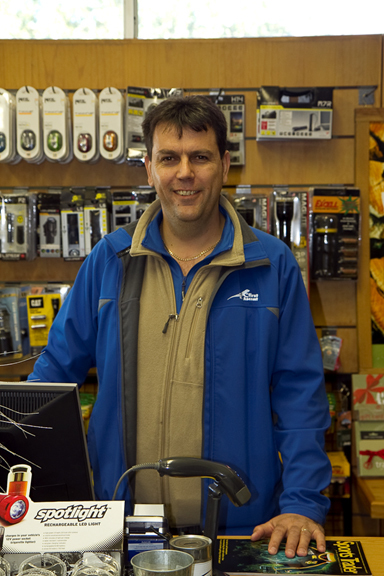 Eager to improve and grow business, he’s always keeping an eye and ear out for new opportunities or advice – for example, a sales rep advised him how to display footwear – and really appreciates the agents that do take the trouble to come and visit his store. “You always tend to buy more when someone pays a personal visit,” he says. 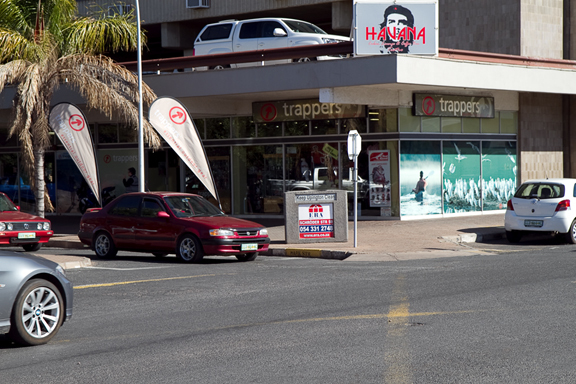 Clothing and footwear is indeed a big market, confirms Trappers manager Nico Visser, who is upbeat about business prospects and opportunities. “There is also always the guy that walks in, looking for a nice shirt. 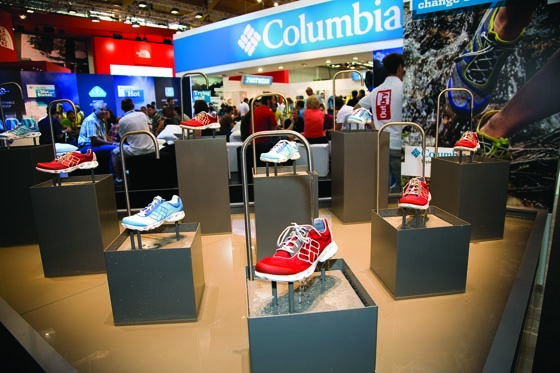 We are quite a fit lot here in Upington, so there’s plenty of interest in running,” he explains their display of Salomon running shoes. Camo clothes for hunting is also a popular item among their customers, half of whom would be locals, about 30% tourists and about 20% from outlying towns. The familiar Trappers logo and store layout helps draw visitors who know what to expect. 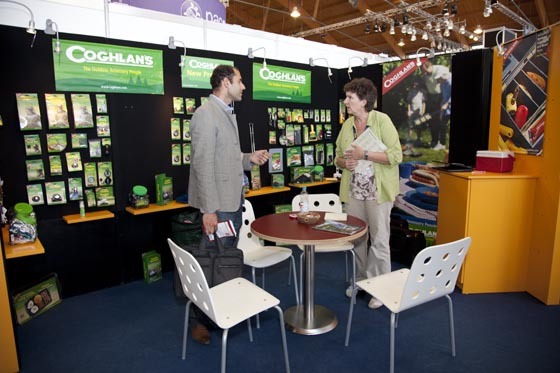 While they benefit from the buying strength of the franchise group, which offers them many special deals, they are free to source their own products and ranges that suit the preferences of their customers. A poster advertising a paintball event on the door is testimony to just one of the many such opportunities identified, with interest in this sport growing since a second field opened in the area. Always looking at new opportunities for growth, Visser subscribes to the philosophy that the business cake is indeed getting bigger. Especially in an area where there are customers with special interests that nobody currently caters for.